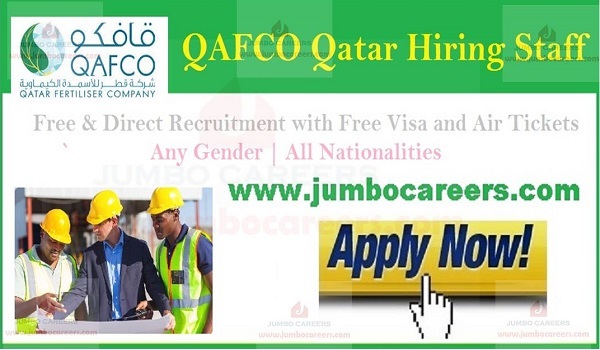 Qatar Semi government company Qafco hiring staff. Qafco free Recruitment 2019 is for engineers and officers. Its a free and direct recruitment by the company. About Qafco Qatar: QAFCO was founded in 1969 as a joint venture between the Government of Qatar and a number of foreign shareholders. The country's first large-scale venture in the petrochemical sector, QAFCO was established with a view to diversify the economy and utilize the nation's enormous gas reserve. After successfully implementing several expansion projects over the past three decades, the Company has evolved into a world-class fertilizer producer. QAFCO is now owned 75% by Industries Qatar (IQ) and 25% by Yara Netherlands. Benefits : Free and Direct Recruitment with Free Visa and Air Tickets.